Sewn With Grace: More Showers of Fun! Today I would like to share with you the items I made for the shower. The first is the signature quilt. 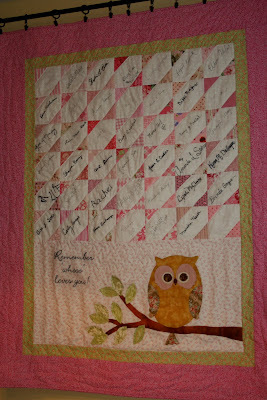 I used Brenda Riddles (Little Acorns) pattern named "Remember Whoo Loves You" as my inspiration. Chelsea collects all things owls and I knew she would love this. I received a list of special women from her Mom and Diane and sent out blocks for their signatures. It was a lot of fun and I really enjoyed doing the applique. It is the first quilt that I have quilted by myself and I did enjoy the process. While visiting dear girlfriends (The Stars) in Ohio. 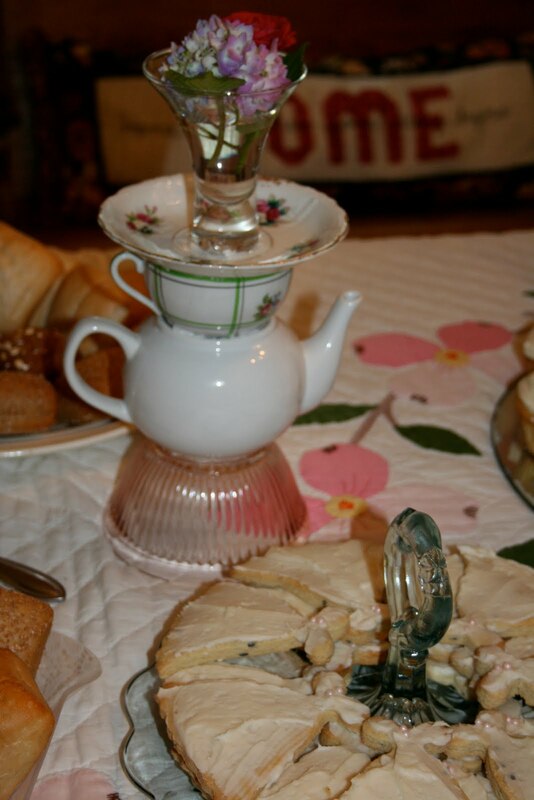 I saw lovely towers made from various pieces of china. As soon as I got home I began looking for pieces to make my own. I used Gorilla Glue and I can tell you for certain that these pieces are stuck together for life. Note to self: read instructions and do not get glue on bare skin. Hard to remove! The cute bride and groom cupcake toppers came from Sur La Table. I used the top of the towers for flowers but you could just as easily use them for candles or candy. 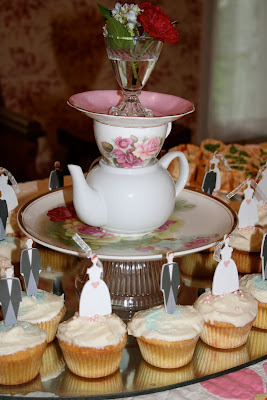 The cookie cutter is a wedding dress and was made from Lavender Shortbread. I plan on using these china creations for years to come. So much fun and very little expense and work. Chelsea, knowing how much I love EmersonMade, purchased this lovely pin as a thank you gift for me. Isn't it pretty? I can't wait to wear it! Love the quilt! It's adorable. I wish you could come over and work your "magic" on my stuff. Everything is just adorable. 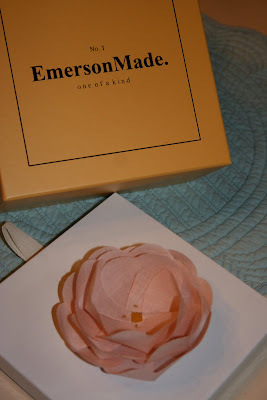 The Emerson Made flower is beautiful; what a great way to thank you! That quilt is darling!! Love the owl!! But, the names are priceless. :) Her shower was beautiful. I bet she will remember it forever and ever. The quilt is such a wonderful idea. 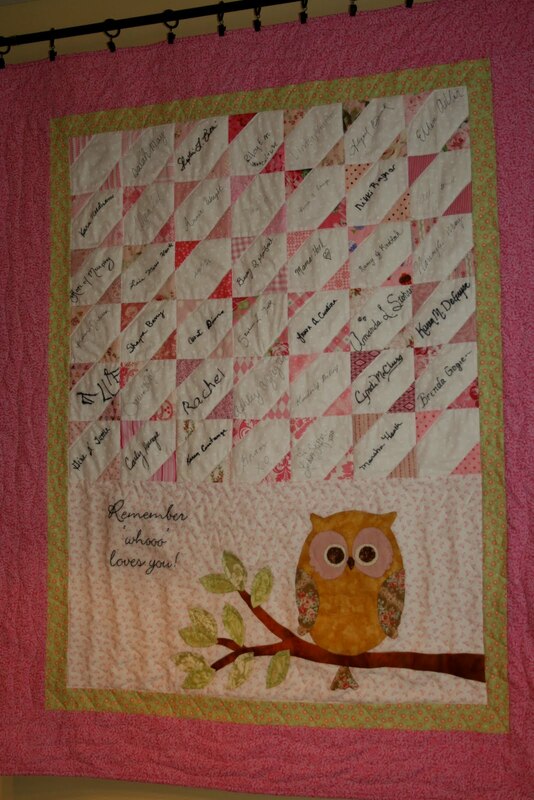 A beautiful keepsake of her closest friends and made by someone special:>) I love the quilt! The table is beautiful and the towers present endless adaptations and possibilities for decorating. Great looking party! Wow, you went to a lot of work! She must've really felt loved! I understand what it's like to really go for it and make everything so special. It's a lot of work, but worth it! Looks like a spectacular shower! So beautiful and how much fun!!! Love the quilt. Also enjoyed the Taylor Swift song..my daughter and I sing along to her.